Boise has come and gone, with many a lesson learned and good time had. The report below is adapted from a report that I wrote for a website. I think I submitted it too late (my bad!) so they didn’t use it, but I’m not one to waste a word or two, so here it is for you to enjoy! As always, feel free to comment below, on Twitter, and/or Facebook. Matt explaining that jean shorts over compression tights actually looks cool. Our Boise 70.3 journey began in Man Van. Man Van is the 1984 Chevy something that Matt Lieto and I took to Wildflower. It gets 12 gallons to the mile, but comfortably fit three dudes, bikes, wheels, tri gear, food, and…two mattresses. The dude-trip to Boise 70.3 consisted of Matt and I, and also Nick Alden – my buddy from Eugene and the guy who “famously” loaned me his bike for Wildflower. Our trip began right on schedule, two hours behind schedule, when we left Bend late Thursday morning. If you’ve never driven from Bend to Boise, you’re smarter than us. It’s 6+ hours of straight road with one turn in Burns, a town that is as exciting as it sounds. We stayed at the home of world class MTBer/Adventure racer/Entrepreneur Matthew Weatherly-White, his wife Andrea, and their daughters. I’ve gotten to know Matt over the last year while using his service Restwise, a system that helps monitor your recovery. He’s a great guy, super smart, and been a huge help this year. They graciously lent us their basement for the weekend, which immediately became Man Cave by the time our mattresses hit the ground and our bags exploded. Race day arrived without a hitch, until Matt almost pooped his pants after he spotted a flat tire on Man Van. Having decided not to early check-in our bikes, we were relying on Man Van to give us a ride to the start of the race. 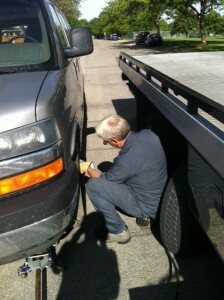 Luckily, AAA had an ex-Jeff Gordon pit-stop chief on call and the dude literally changed our tire in 6.5 minutes. Shake and bake baby, shake and bake. The weather on race day dope (good), so all this ho-hum about thunderstorms and rain was just Boise trying to psych us out. You got nothing Boise! However, the rumors about the water temp were true, an arctic 53 degrees. Touché, Boise, touché. The first thing I noticed when I started my swim “warm up” was not my frozen hands or feet, but my teeth. They were REALLY cold, and I’m not going to lie, it kind of freaked me out. Luckily, I literally ran into Matt on the warm up, and told him about my teeth. He said that he was really sorry but that everything would be OK. He’s a veteran, so I listened to him. Then he told me to watch out for penguins. As usual, we all went out hard and slapped each other repeatedly in the head, back, and legs until we were bored and started swimming. From my point of view the swim unfolded pretty simply – some guys started swimming faster than me and eventually I couldn’t see them anymore. From what I was told, the leader out of the water was either Kyle Leto or Matt Lieto, I always get them mixed up. Kyle crushed the swim with a 22 something. He was followed by Paul Ambrose & Guy Crawford, with the lead pack coming out closely behind them. My cold teeth and I were about 20-30 seconds behind those guys, definitely a solid swim for me. You can seriously tell I'm trying to plug my water bottle with my thumb, awesome! Thanks Brian Roddy of Rolf Prima for the awesome pic. The top 6 formed a group early on the bike, but set a hard pace that eventually broke it open. From what I hear, Ben Hoffman motored to the front and never looked back, to a race best 2:05 or something ridiculous like that. He was followed by Lieto, Ambrose, Crawford, and Trevor Wurtele, who moved up from behind with a solid 2:09. I had my own problems to deal with. My totally awesome home-made under-seat-water-bottle-mount…failed…at mile 1. No, the water bottle didn’t fall out, the ENTIRE CAGE fell off (Stanford didn’t offer a class in under-seat-water-bottle-cage design, OK?). This meant I was limited to one bottle at each aid station. Luckily one of the bottles I got from an aid station didn’t have a cap (oh wait, that’s bad), so I literally plugged it with my thumb for about 10 miles, rad! But at least I had Tom Jones “It’s Not Unusual” in my head during the ride, which kept me pumped up…not. So, anyway, I never caught the leaders, but still rode solidly with Nick Thompson and Jeff Symonds, coming in about 7 minutes behind Ben and 3-4 minutes behind the other guys. Nick set a ferocious pace early in the run. I knew I wasn’t feeling too hot (or was feeling too hot?) so I tried to “ease” into it and give him some room. I went through 2 miles at about 11 minutes and he put an easy 15 seconds on me, dude was rolling! At about 5 miles, Jeff and I had taken about 2-3 minutes off of Hoffman’s lead (Nick probably 30 seconds up), and pulled up on Ambrose. Then it was implosion time. I hadn’t been feeling too great, and man I started feeling a whole lot worse. Right as I was passing Ambrose, Jeff went by. I tried to go with him, and couldn’t. Then Ambrose started pulling away, or I just slowed down (I ran my last 6 miles 4+ minutes slower than my first 6). Either way, it wasn’t pretty. Luckily, I had enough cushion to suffer-run the rest of the way at increasingly slow splits and stay in 5th place. Hoffman stayed strong and won huge in like 3:52. Nick had a breakthrough performance, holding his early pace to a race best 1:13 run and second place. Jeff also ran incredibly (1:14) for a huge performance and 3rd place. Ambrose finished 4th. Props to all those guys for finishing strong on a tough day! It was a solid finish, and objectively, I have to be pretty happy with the result. I had a great swim – I was 8th out of the water, and only 20-30 seconds off the main front group. I came off the bike in a great spot despite not feeling too awesome out there. I finished 3 places higher and something like 12 minutes faster than last year. 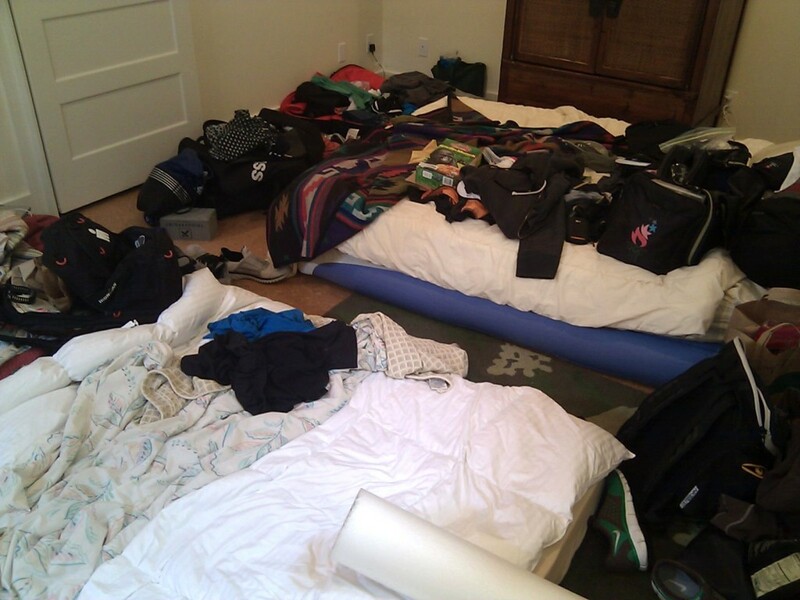 And, all of this only 6 days after a solid race at Alcatraz. Yes, I’m definitely a little disappointed with my run, or at least the second half of my run. Yes, if I’d put it all together on the day, I could have run into the top 3. But it didn’t happen. I might have been tired, dehydrated, or just not feeling great, who knows. Learning points for next time. But if you’d asked me three months ago if I’d be happy with a top 5 at Boise, and my first sub 4 hour half Ironman, I’d have answered with an emphatic Boomshakalaka (which means yes)! So I’m happy with my race, happy the weather held out, and happy that the Idaho Beef sponsor handed out free burgers at the finish line. Matt, Nick (who had a huge 22 minute PR!) and I celebrated with his brother Paul (also a huge PR) and friends by eating some world renown Boise sushi. It was all you can eat and 2 blocks from awards, so done and done. We may have had a few adult beverages as well. I’m on a mini break for a while, then I’m back at it in a month at the Portland Rev3 on July 10. This will be my first and only major race in Oregon. So if you’re in the area, feel free to come by, watch, and say hello! Would be awesome to see you. Matthew Weatherly White, his wife Andrea, and their daughters for providing Man Cave. You guys couldn’t have been more hospitable and friendly. You made the trip easy, fun, and of course, cost effective. 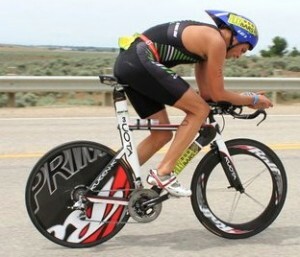 Paul Thomas, for loaning me his bike for the race, in addition to all the advice and help he’s given me along the way. Thanks Paul! Matt Dixon, as always. First completed back to back with solid results. We weren’t even expecting this 6 months ago, so I think we’re on the right path. Gerry Rodrigues, for the open water swimming skills as usual. Getting closer Gerry! Matt & Nick for some good times in Man Van and Man Cave. Had a great weekend dudes. Nick, thanks for driving 98 miles and hour on the way back while Matt and I peaced out. Brian Roddy at Rolf Prima, not only for the wheels obviously, but the race pics! Great to meet some solid Rolf Prima athletes this weekend, Heather & Trevor Wurtele & Guy Crawford. Looking forward to seeing you at more races. Chance Fitzpatrick, my “massage guy,” for keeping me loose and ready to race before and between two solid outings. Back to work now! My wife, my family, my Twitter/Facebook peeps and the rest of my Support Crew as always! You guys make it happen, fun, and keep me inspired. Solid. But what happened to your sweet tat from last time? And, just for the record, that biking thing looks entirely uncomfortable. As always, a great read. Great job out there Jesse! Inspiring performance Jesse! Was definitely cool running into you and Nick at Boise. Keep it up! Thanks for this entertaining report Jesse. Glad to see you are having some time to commune with nature and spend time with Lauren Good luck in Portland. Matt may be “super smart”, but either blind or fashion-challenged. Great job, Jesse.